Will the Infinity War steelbook only be available in 4K (which is posted to the website) or will it be available in the normal steelbook like many other movies? Thanks for joining our forum, and thanks too for your question. I'll be happy to speak with you today. I watched Infinity War on Friday and it left an impression unlike anything I've seen from Marvel to date. I can't wait to see it again (not to mention the as-yet unnamed sequel!). At this time it does appear only the 4K edition will include the steelbook, but there's certainly plenty of time for things to change between now and the release date. I've asked my business partners if they know anything that I could relay to you now, however, so if I hear back I'll let you know. Thank you so much for your reply! We don't currently have a 4K TV, but if this ends up being the only option would I still be able to use the digital version included to watch this movie? I'm afraid I don't have any different information I could share at this time, but I would still encourage you to watch what's listed here and to pre-order that steelbook that's currently available as soon as possible. I would not at all be surprised to see this one sell out. I just caught your second question. Yes, if you pick up the 4K edition you'll get the 4K version, a standard Blu-Ray, and the digital code to use online. If your TV is set up to a smart device you shouldn't have any problem playing the content that way. The Steelbook version of the Avengers Infinity War will have the 4K disk, a standard Blu-Ray disk, and a digital copy of the movie, just like the other Steelbooks that have been offered in the past? Welcome to our community. That's a great question. 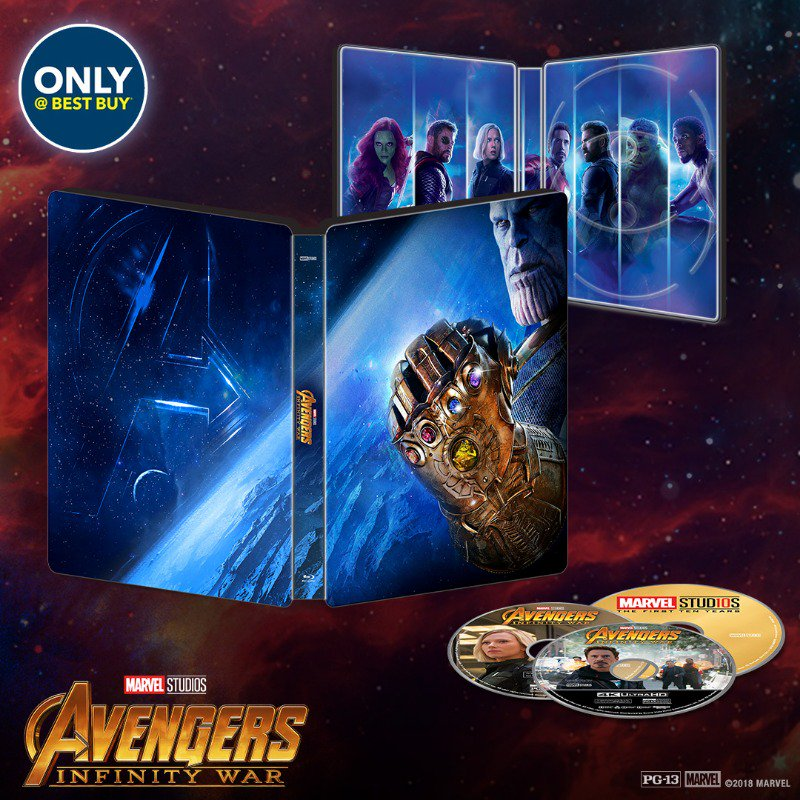 I've recieved the clarification you requested and the Avengers: Infinity War SteelBook does indeed include the 4K UHD disk, standard Blu-ray, and Digital Copy. Thanks for joining our forum! Thanks too for bringing your questions to us regarding the Avengers: Infinity War steelbook edition. I recently looked into this and can confirm that the image showing two discs is correct. These are the 4K and Blu-ray discs. We are not including a bonus disc. I'm sorry for any confusion. Thank you for all of the information so far. If someone preorders the steelbook, do you receive access to the digital copy when it releases since the digital will be available two weeks earlier?